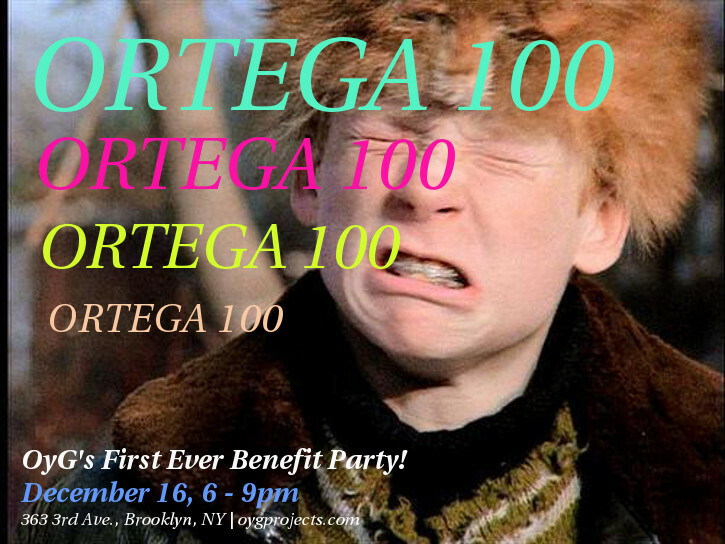 ORTEGA 100: OyG’s First Ever Benefit Party!!! Wine provided by GOOD WINE!!! Check em out! Please join us on Wednesday, December 16th for ORTEGA 100, a ONE-NIGHT ONLY holiday party, exhibition and art sale. Attendance is FREE for all!!! If you have pre-purchased a ticket ($100) you will be guaranteed a work of art by some of today’s most exciting artists. If you buy a ticket on the night of the event, it’s $125, but that’s still a steal!!! Dibs will be given through a raffle-style system. Luck of the draw gets to choose the next piece! Your generosity not only helps keep the gallery running, but aids us in attracting a dynamic mix of emerging artists, curators, art-enthusiasts and collectors. Payment for raffle tickets can be made through paypal to oygprojects@gmail.com. Please note your name when making payment. Tickets will also be available at the gallery during open hours via cash or cheque. Please note, contributing artists have a discounted ticket price if they wish to purchase a work of art. Attending the party and viewing the exhibition are free of charge. Tickets for artwork on the night of the event will be $125.00. To preview some of the available work, please visit OyGProjects tumblr page. You’re invited! Go to our facebook page to tell us you’re coming! Lauren Adams, Mike Ambron, Eleanna Anagnos, Hayley Anderson, Liz Atz, Emily Auchincloss, Damon Arhos, Lisha Bai, Jen Bandini, Michael Beggs, Michael Berryhill, Joshua Bienko, Rick Briggs, Clare Britt, Aimee Burg, Rachel Byrd, Lauren Cardenas, Kari Cholnoky, Rupa Chordia, Jennifer Coates, Sam Cockrell, Andy Cross, Rachel Debuque, Mark Dixon, Mark Joshua Epstein, Ash Ferlito, Heather Garland, Ashley Garrett, Kati Gegenheimer, Rubens Ghenov, Rachael Gorchov, Alyssa Gorelick, Alina Gregorian, Catherine Haggarty, Clay Hapaz, Emily Hass, EJ Hauser, Karen Heagle, Craig Hein, Jay Henderson, Eric Hibit, Fritz Horstman, Carrie Hott, Jackie Hoving, Will Hutnick, Akira Ikezoe, Liz Insogna, Sam Jablon, Emily Janowick, Layet Johnson, JULIACKS, Irena Jurek, Elsie Kagan, Lucy Kim, Hein Koh, Suzy Kopf, Dani Leventhal, Aubrey Levinthal, Katherine Mann, Rachel Mason, Patrick McElnea, Leeza Meksin, Larissa Mellor, Susan Metrican, Jeffry Mitchell, Ian Murphy, Mike Olin, Sheryl Oppenheim, Norm Paris, Liesl Pfeffer, Justin Plakas, Nikola Pottinger, Vivian Qin, Julie Ribeiro, Scott Robinson, George Rush, Netta Sadovsky, Naomi Safron Hon, Jen Shepard, Polly Shindler, Winnie Sidharta, Paul Simmons, Jered Sprecher, Michael Stickrod, Claire Stigliani, Amy Stober, Julie Torres, Hooper Turner, Denise Treizman, Zahar Vaks, Nichole Van Beek, Lee Vanderpool, Nick Van Zanten, Michael Veliquette, Andy Weber, Jenna Weiss, Lauren Whearty, Daniel Wilson, Sheilah Wilson, Kelly Worman, Karla Wozniak, Geo Wyeth, Sun You, Alex Zandi, Almond Zigmund, Kaini Zhou, and more!